Crop rotation is a system of growing different kinds of crops in recurrent succession on the same land. Extended crop rotations have more diversity or more types of crops than the average series of crops in rotation. For example, adding wheat to a corn-soybean rotation series, would increase the types of crops in the rotation series and could be referred to as an extended crop rotation. Extended crop rotations have the potential to build soil organic matter, increase carbon sequestration, improve soil quality and minimize greenhouse gas emissions. Increasing the diversity of cropping systems has the potential to maximize resiliency of the corn-based system under variable weather conditions. Much of the Corn Belt states have a significant percentage of agricultural land area in a corn-soybean crop rotation. When corn prices increase, corn-soybean rotations are often replaced with continuous corn. Currently, approximately 20 percent of all acres in the Midwest Corn Belt are in continuous corn. This number is likely to increase in the future as demand for corn grows. 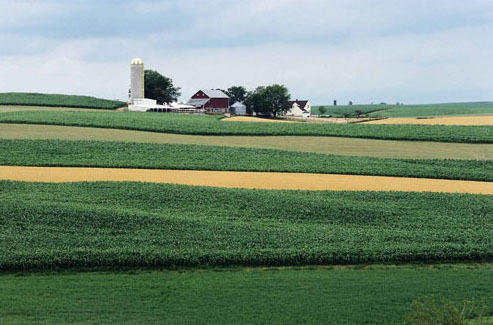 This project will use data collected from long-term (20 years) established rotation experiments and by performing a set of new experiments to compare no rotation (continuous corn), two-crop rotations (corn-soybean), and extended rotations including a third crop (e.g., winter wheat or oats) or another crop harvested multiple years (i.e., alfalfa). "A corn-soybean rotation certainly works, but our data shows whenever you have three or more crops in rotation it benefits all the crops in that rotation," says Joe Lauer, a professor of agronomy at the University of Wisconsin-Madison and a principal investigator on the Sustainable Corn Project. Strock, J., & Dalzell, B. "Understanding Water Needs of Diverse, Multi-year Crop Rotations." Resilient Agriculture. Aug. 2014: 18-19. Print.